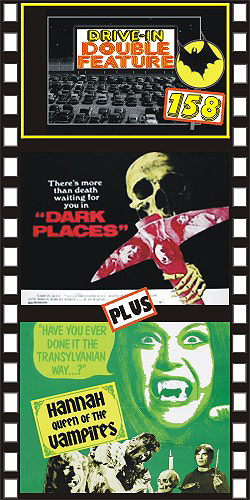 DARK PLACES (1973) Christopher Lee, Joan Collins, Herbert Lom, Robert Hardy. Hardy plays the head of an asylum who has inherited an eerie old mansion from a deceased patient—a patient who murdered his wife and kids on the premises! Legend has it that there is a hidden fortune in the walls of the house. Also searching for the loot, though, is Lee—the mysterious local doctor—along with his beautiful sister, played to the hilt by Collins. Both give wonderful performances. Sadly for all, the house seems to be haunted. This film, though low budget, is highly atmospheric and features a terrific nail-biting climax. A minor gem. Nice color, from 16mm. PLUS: HANNAH, QUEEN OF THE VAMPIRES (1973) Andrew Prine, Patty Shepard, Mark Damon, Teresa Gimpera. Prine and Damon are two archaeologists on a scientific dig when they discover a vampire cemetery. To their horror they discover that the blood-sucking monsters are awakening soon to attack a village. Cool. Nice color, scope, 35mm.